Most of the available tweaks to reskin Windows 7 today requires patches. If you don't want this but still want to play around with your Windows 7 or Vista taskbar skin then you can try AeroWorks free edition. 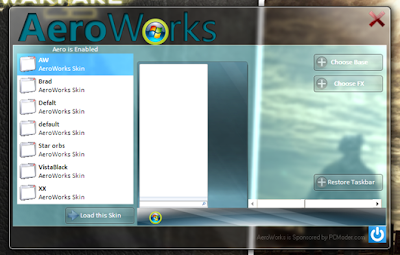 AeroWorks allows you to change taskbar background and special effects. Seven skins are already included and ready to use. You can add your own images and special effects by clicking on the Choose Base and Choose FX buttons. Unlike other tweaks, AeroWork doesn't modify your system and if your not satisfied with the changes, you can always roll it back anytime.